The Gift of the Quoxxel, 2nd ed. An isolated tropical island. A whimsical, incompetent king who just wants to see the world. A mysterious girl. Sea monsters and pirates. Extra-dimensional lizards who may or may not exist. What kind of mad wonder is this?! You can tell before you even open The Gift of the Quoxxel that it’s going to be a quirky trip. And you would be right in that assumption. 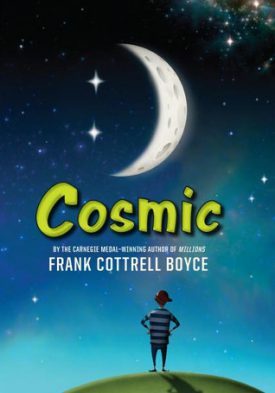 This is quite the whimsical genre-mash, with a lot of fantasy but also elements of science fiction and mystery, plus a lot of humor. If you’re a fan so Seussical neologism or Alice in Wonderland-style whimsy, this is the book for you. 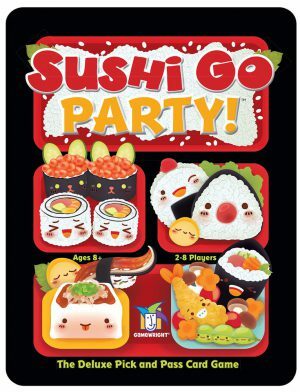 It’s filled with quirky characters, long strings of alliteration, and plenty of surprises. For myself, I did personally find the surprises to be a bit too obtuse for my taste. It was like the author tried to keep things so mysterious at points that I just found myself getting lost. Not that I get the feeling that everything is supposed to fall into place and be perfectly understood. It’s not that kind of story. But . . . I kind of found myself getting lost in the whimsy at times. Still, The Gift of the Quoxxel was a fun trip, and even better, one that’s appropriate for all ages. Jack’s summer promises to be anything but enjoyable–his mom’s working extra this year to support her kids, so Jack’s left to take care of his sister Maddy who never talks and needs extra-special care. He can’t even spend the time he’d like making friends . . . and that girl who lives down the street and practices swordplay in the yard sure does look like she’d be an interesting friend. A family trip to the flea market changes everything, however, as an unusual man sells Jack a pack of weird seeds, promising they’ll change his life. They certainly do that! For one thing, Maddy gets remarkably excited about these seeds, pouring herself into planting and taking care of them. For another, well, the seeds sure do seem to be magic–as in, some of them get up and move, some have faces, others explode or give you special abilities if you eat them. Crazy cool stuff, but pretty dangerous, too. Enter the sword-swinging girl from down the street. Lilly is entranced by the incredible things Jack and Maddy have growing in their back yard, and she knows how to deal with the more dangerous stuff. Maybe this summer won’t be so bad after all. Wow. I have loved Ben Hatke’s work ever since I first read Zita the Spacegirl, and Mighty Jack was certainly not a disappointment. It sort-of plays off the whole Jack and the Beanstalk story, only it’s re-imagined to such an extent that it doesn’t really feel like a retelling at all; it’s brilliantly original. As with the Zita stories, the characters, art, and story are all fresh and rich, colorful and inviting. It all just draws the reader in in such an enjoyable way. I loved all three of the main characters, the way they fit together, the way they grow throughout the story, the way their flaws influence the progression of the story, all of it. Extra perks to the author for strong female characters, for a cool homeschooler, and for including a character with autism, all of whom are a rich part of the story. I loved Jack and Maddy’s mom and Lilly’s brother as well–yay for developed and interesting supporting characters. Bonus points for the cameo of characters from the Zita stories–the guy who sells Jack the seeds and basically jump starts his whole story is a crossover character, and his placement in this story was fun. Regarding the art in particular (besides the obvious fact that it’s awesome), I loved Hatke’s skill in giving subtle expression to the characters, especially in the way he showed so clearly how Jack is just at the age where girls are becoming interesting and how he totally has a crush on Lilly, but how their relationship grows to be so much more than that. It’s powerful, how much he can express with so little. Also, I totally love the color palette used in this graphic novel. Mighty Jack is a graphic novel that I would highly recommend for anyone, regardless of age, although it’s technically children’s fiction–great story that I’m looking forward to continuing in future volumes. Dog brings home a build-your-own-robot kit and finds his new best friend–Robot. The two do everything together: library trips, movies, the beach. Well, the beach was a bit of a mistake. Or rather, the water was a mistake for Robot. He rusts up so he can’t move! Dog doesn’t know what to do, so after trying everything, he quietly slinks away, feeling guilty for leaving his friend. Gradually, Dog tries to move past the guilt and loneliness by making new friends . . . with mixed results. Meanwhile, Robot lies abandoned on the shore, daydreaming about all sorts of might-have-been’s and could-be’s. But maybe there’s hope for both of them yet. 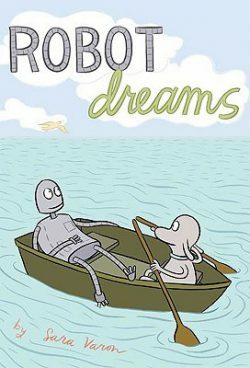 I really enjoyed this cute graphic novel, Robot Dreams. The art is simple but bold, not especially beautiful, but oddly attractive and expressive nonetheless. It works well for the story. And the story is unexpected, to be sure. At first, it’s all happy and sweet–the kind of story you give an upbeat soundtrack with birds singing in the background. Then everything gets all sad and poignant–somehow heartwarming and heartbreaking at the same time. I love that the story resolution is at the same time unexpected (not at all the stereotypical happy ending I had figured would come) and cathartic; there’s a great message of healing and forgiveness there that I think is great for readers of all ages. And that’s something else that is great about this graphic novel–it really is appropriate and enjoyable for everyone from pretty young kids to adults.